The London tube is a subway train system serving the city and suburbs of London. The tube is a smart, safe, cheap way to get around London—use it to see the tourist sights or hop on and ride to understand how the city is laid out. There are 275 tube stations (63 in central London)—it seems as if there is a tube stop everywhere, once you're looking. Opened in 1890, the London tube is the oldest underground in the world, and entire blogs are dedicated to its current workings and history. Some detail current stoppages and delays, which drive many locals nuts; just relax and enjoy the ride if you're a traveler. 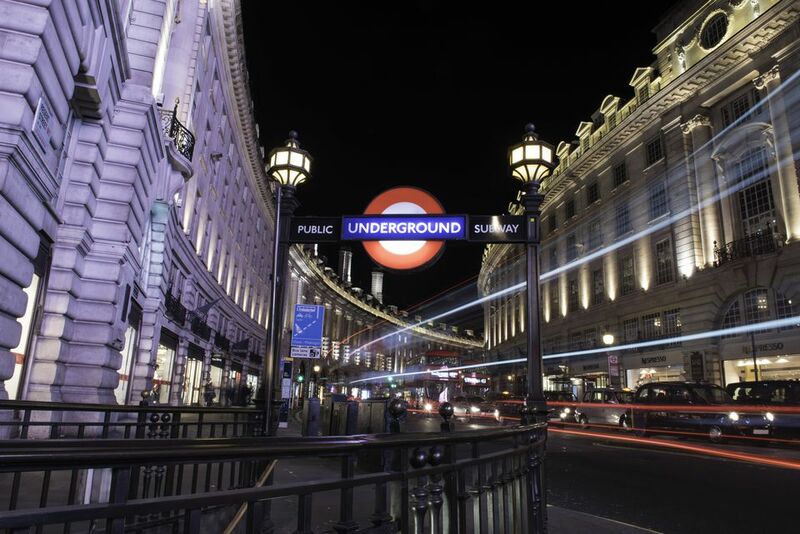 Read on to learn how to use the London underground. London has a total of 12 tube lines with trains running every few minutes between 5:30-3:30 a.m. Monday through Saturday, and 7:30-11:30 on Sundays, according to the official London Underground. Finding your way to the right tube station and the tube stop you need is remarkably easy, even without your own tube maps. You'll want a tube map, though—get free tube maps at any underground station office. You can check out free tube maps online before you go, but you needn't download one to carry across the pond—tube maps are easy to grab at any train station, and you'll find tube maps posted generously on station walls. When you hit your first London tube station (used to be Waterloo, above, and is now St. Pancras if you're coming in on the Eurostar train from France or Belgium), you'll see signs everywhere—overhead and on the walls—telling you what to do and where to buy London tube tickets. Tube workers are hanging around at ticket windows, ready to sell you passes and explain what you need—they're also manning turnstiles leading to tube tunnels, through which you can't pass until you've got a tube ticket. One ticket equals one tube ride, which is great if you're going one place (and you know how to get there). Otherwise, buy a one or several day London tube passes or a credit card-sized Oyster card, which gives you a set amount of rides for at least a week, works on central London buses and segments of National Rail trains, and is hard to lose. My one-week Oyster pass was about 22 pounds in March 2006. Small LED signs on station turnstiles are green if you can go through and red if you can't; tube workers stand patiently by and point that out, and they'll help if you can't get through. When you do pass through the turnstiles, you'll first feed your ticket into a slot or pass your Oyster card across a pad; the ticket pops back out—hang on to it because you'll need to perform the procedure in reverse to get out of the train station at your destination. London trains and platforms are described by the compass point to which they're bound depending on the tube line's direction, as in eastbound, northbound, westbound or southbound. Tunnels inside the tube station are marked with train line names and the compass direction of a given tube stop. A readerboard on the front of a London train and signs on the tube stop platform show the train's final destination. By ascertaining the train's final London destination, you can find its line and, subsequently, whether your stop is on it. Each London train line/route has a color—as in red or brown—which makes it simple to follow its route on a map. Find a London tube map to find the direction you're bound and follow signs to tube tunnels within the train station accordingly; follow the tunnel and you'll wind up on the right platform to board the right train going the right way. Reading signs that look like temperature graphs in a London tube station, especially on platform walls, will help reassure you that you're in the right place and at the right tube stop. The station at which you are is marked with the equivalent of "You are here;" note the names of the next stations and where your stop is accordingly. You might need to change trains to get where you're going—just check out the closest intersection on a tube map before you get on the train, get off at that station, and find the next train you need to take by going upstairs or up an escalator (stay to the right so busy commuters can pass) and following the signs to the right east, west, south, or northbound​ train tunnel marked with the name of the last stop on the line on which you need to travel. And if you feel unsure of yourself, check out the wall graphs showing train stops, which you'll see everywhere on the platform for the train which you're about to board. After you get on a London tube train, look overhead near the train doors and you'll see a graph on the inner tube wall showing the names of stops for the train you're on; the stop at which you just boarded will be marked. Look for the tube stop at which you want to get off and note the names of the stops around it, and count the number of times the train will stop before it reaches your destination. Watch for your stop by counting stops or looking out the train doors when the train stops and reading the name of the stop on station walls (Oxford Circus in the picture above). Compare it to the graph overhead to understand where you are. You might also hear announcements on the train's PA which will tell you where the train is about to stop seconds before it does. Sometimes you'll also hear an announcer saying, "Mind the gap." Those amplified voices you hear saying, "Mind the gap" when you're on the London tube? "The gap" is the space between the train and the tube platform, created after the train stops. Nobody wants you to fall in the gap. Once you're on the London tube, relax and do some people watching. It's practically impossible to get lost at this point, and tube seats are comfy and pretty plentiful except at rush hours in the early morning and late afternoon. You can find folded jump seats next to the doors, and overhead grab bars exist in case you're standing up. Many fellow riders, especially in summer, are tourists, just like you. The folks at the London Underground have some tips designed just for tourists using the London tube. The London tube is remarkably clean and safe. Tube riders are going about their business, just like you are. Be polite, mind the gap and don't take up tons of room with your backpack, and you'll coexist with London tube riders perfectly. Please do not bring more luggage than you can carry. Unlike mainline railways, the Tube does not have porters. Our staff are trained to help you but carrying excess luggage is not one of their duties. If you are traveling with a backpack, take it off and stand over it on the floor of the carriage. This takes up less room. Londoners stand on the right on the escalators at all times. This allows those in a hurry to get past. Please stand to one side of walkways and platforms when looking at maps. Better still, ask our staff for directions. Please allow passengers off the train before you board. This is not just the British being polite but is the safest and quickest way for a train to unload and load passengers. Please stand behind the yellow line on platforms. That's it—you're now a London tube pro. You'll find that many directions you're given when traveling in London mention a tube stop—makes it a snap to get around. The signs above black fenced stairs leading underground show you tube stops; simple to find. And most locals can tell you on what corner the nearest tube stop is. Some big London tube stations have several entrances and exits. If you're given directions, remember which exit is mentioned so you'll emerge from the tube station on the right corner. In the Piccadilly Circus station, for instance, there are four exits—each is marked with signs showing the streets to which stairs will lead. Holdups happen—the London tube system is as subject to delay and malfunction as any subway anywhere; PA announcements in stations will let you know if a train is running behind or not at all.